April 8-12 denotes Tornado and Severe Weather Awareness Week in the State of Wisconsin. The National Weather Service and your local first responders remind community members that this is a good time to review safety plans in order to be ready for a severe weather event. The best time to prepare for a severe weather event is well before the storm strikes. Take the time to create a safety plan with your family and be certain you are all aware of the steps you will take in the event of a weather event. Sign up to receive text or phone alerts from the Outagamie County Emergency Management office through the AtHoc Public Emergency Notification System. This service is free, although standard messaging rates may apply if you sign up with your cell phone and your cell phone carrier charges for text messages. Individuals who are signed up will receive phone or text messages with updates when there are severe weather events, or public safety or life safety notifications critically important to local residents. Sign up takes a matter of minutes and could keep you and your family safe in an emergency. Keep a well-stocked first aid kit on hand in your home. A small fire extinguisher is recommended, too, and are available for purchase at many hardware stores. Learn how to administer basic first aid and know how to use the fire extinguisher in case of an emergency. If you have children, discuss with them the importance of the tornado and severe weather drills they practice at school. Be aware of their school’s emergency dismissal policy and be sure your child knows where they are to go in case of a tornado or severe weather event at their school. Pick the safest room in your home to gather in case of a severe weather event. This should be a room on the lowest floor (basement or storm cellars are preferred, if available options), or an interior room on the lowest floor of your home without windows. Listen to a NOAA (National Oceanic and Atmosphere Administration) Weather Radio for latest updates OR television newscasts for the latest information. Many local television stations have mobile apps for your smartphone that will provide breaking local weather updates. If you have a smartphone, keep it with you and keep a charger nearby so that you can receive weather updates (especially if you do not have a weather radio) and so that you can communicate to your friends and family that you are safe. If you are outdoors when a tornado or severe weather strikes, get to an indoor location if at all possible. If you are unable to get to an indoor location in the event of a tornado and you are in the open outdoors, head to a low, flat place that is removed from cars or trees. Lay face down on the ground as flat as you can and protect the back of your head with your arms. If you are in a car or truck during a tornado and are unable to get to an indoor location, assess your surroundings. If you are able to safely get to a noticeably lower level than where your vehicle is, park your car and lay face down on the ground in that location, as flat as you can and protect the back of your head with your arms. Do not be tempted to take shelter under bridges or trees – this can be more dangerous. If you are not able to get to lower ground and extreme winds/flying debris are already moving, park your vehicle, keep your seatbelt on, put your head down below your windows and cover yourself (if possible) with your hands, a blanket or a cushion. The City of Kaukauna has partnered with Outagamie County and will be providing a limited number of (approximately 50) NOAA weather radios at no charge to City of Kaukauna residents during the month of April. 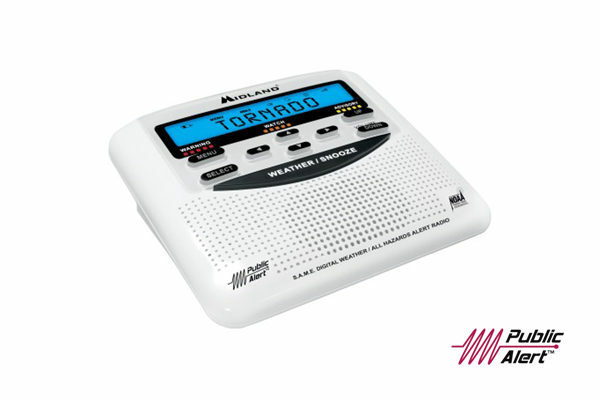 Weather radios (when plugged in and turned on) provide updated local weather and severe weather alerts and can be an excellent resource for individuals who do not have internet connections or cellular phones with emergency alert capabilities. The City of Kaukauna hopes to place these NOAA weather radios in the hands of vulnerable members of our population, who live by themselves, do not have access to the internet or cellular phones, and could benefit from having a weather radio in their home. These radios are intended to be used for City of Kaukauna residents and are limited to one per household. Approximately 50 weather radios will be reserved for the first 50 people to call and request one beginning on April 8, 2019. Please contact the Mayor’s office beginning on April 8, 2019 at (920) 766-6310 during business hours to request one. Please do not call regarding weather radios prior to April 8, 2019. You need to speak with a staff member in order to reserve one as we do need to collect information on individuals receiving them. Again, leaving a voicemail or sending an email does not add your name to the reservation list for weather radios, you must speak with a member of staff. Radios will be kept on-hand for individuals who reserved them to pickup through the end of April. Reservations for radios will only be held until the end of April. Please help us ensure that these radios find their way into the hands of those who need them the most by only reserving a radio if you find yourself in a place of economic hardship or as a member of a vulnerable population group. Thank you for your honesty and for helping us encourage safety and preparedness during Tornado and Severe Weather Awareness Week. Questions? Please contact Mayor Anthony Penterman’s office: [email protected], (920) 766-6310.